It’s already a couple of months now that Brussels Airlines is flying a small fleet of factory new Sukhoi SuperJet100’s which are, as every luchtzak.be reader already knows by now, ‘wet leased’ from CityJet. This means that both plane and crew are provided by CityJet. In the meantime, I already have flown 8 times as a passenger on one of the SSJ100’s, so it’s about time to review this quirky regional jet. At this moment, as a Brussels Airlines passenger, you will board a SuperJet100 in either Brussels Airlines or CityJet livery. I’ve flown on both, and the only difference can be found on the outside. The interiors of all SSJ110’s flying for Brussels Airlines are identical. Occasionally, some airports allow passengers to board both at the front and the rear of the plane. Both the galleys there provide more than enough space for a crew member to comfortably welcome the passengers. Taste differs obviously, but I personally find the Sukhoi SSJ100 a beautifully designed plane. Specifically the nose and slightly drooping windshield design contribute to the SSJ100’s distinct look that suggests efficacy, speed and manoeuvrability. Anyway, once up the stairs, the first thing that drags the attention is the remarkably fast boarding procedure. This is due to the copious overhead luggage space. 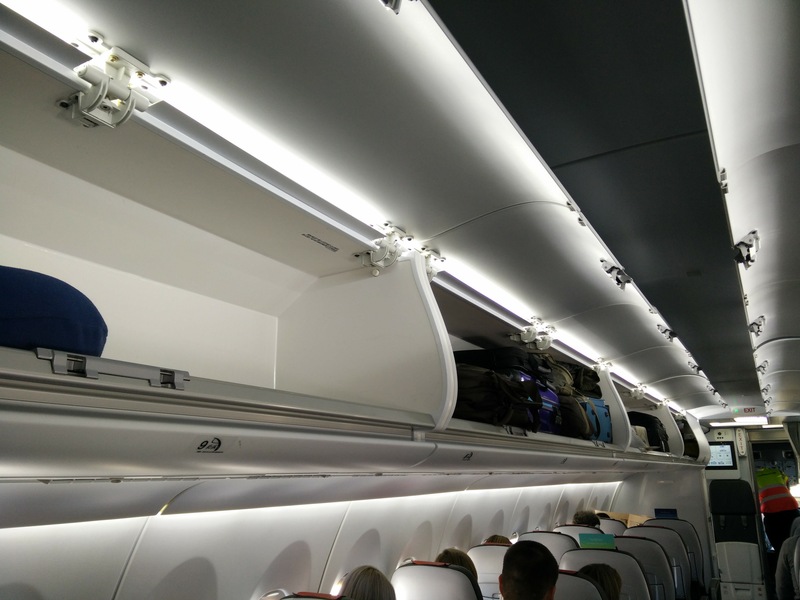 Even slightly oversized trolleys easily find a spot in the overhead bins. So no need to leave hand luggage at the aircraft stairs, no passengers walking ‘upstream’ to put their hand luggage somewhere else, no stressed looking passengers or crew, no unhappy faces of people who have to put their hand luggage under the seat in front of them, etc. The Sukhoi SuperJet100 is operated on routes for which Brussels Airlines previously operated AVRO RJ100’s. That aircraft type had the very big disadvantage of having lots of luggage space being ‘eaten up’ by its wings protruding through the cabin ceiling. I’ve never seen a single AVRO RJ100 flight leaving without some kind of quarrel between passengers over luggage space. This is the first point where the SSJ100 comes as a big improvement. 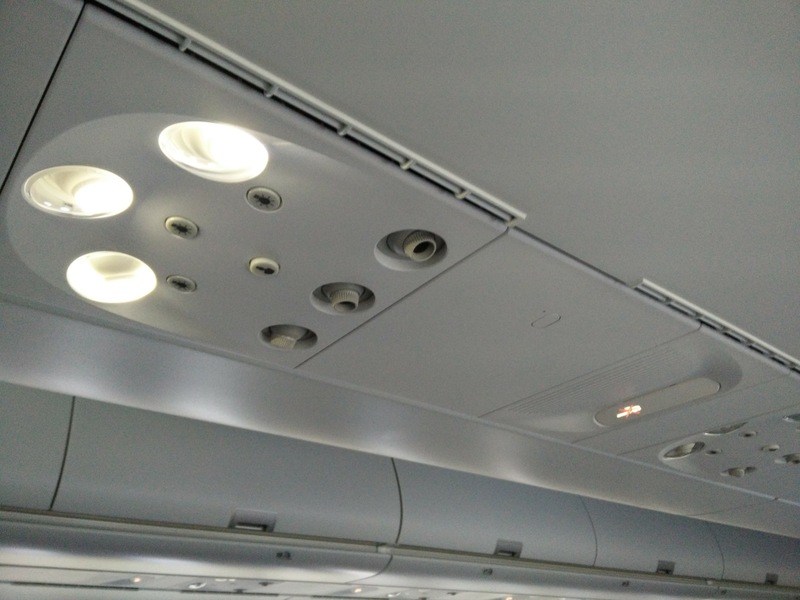 One of the small details that prove the interior design of the Sukhoi SuperJet 100 to be well thought through, is the LED cabin illumination which, when the overhead luggage bins are opened, projects its light onto the compartment doors, giving the airplane a very light, airy and welcoming atmosphere when boarding. The SSJ100 comes in a 2+3 seats configuration, but the aisle is designed a bit wider than usual, which makes it easy for passengers and/or crew to cross each other. In other words, if you need to cross someone, neither that someone or you will have to sit on one of the other passengers’ lap. Again quite a nice advantage of the SSJ100 over other regional jets. The leather seats are stylish, sleek, comfortable, can recline and provide what is basically the most important thing every single passenger is longing for: leg space. I measure 1m87, have long legs, and I always struggle to sit comfortably in the economy class seats of any plane with any company. Whether it’s a Singapore Airlines A380, or a KLM B-747, my trip is already ruined the moment I sit down. The Sukhoi SSJ100 is the very first plane in which I can sit comfortably without having to upgrade to Economy+ or Business class. A major major major advantage!!! The table is rather small, but can be adjusted as with most plane types. 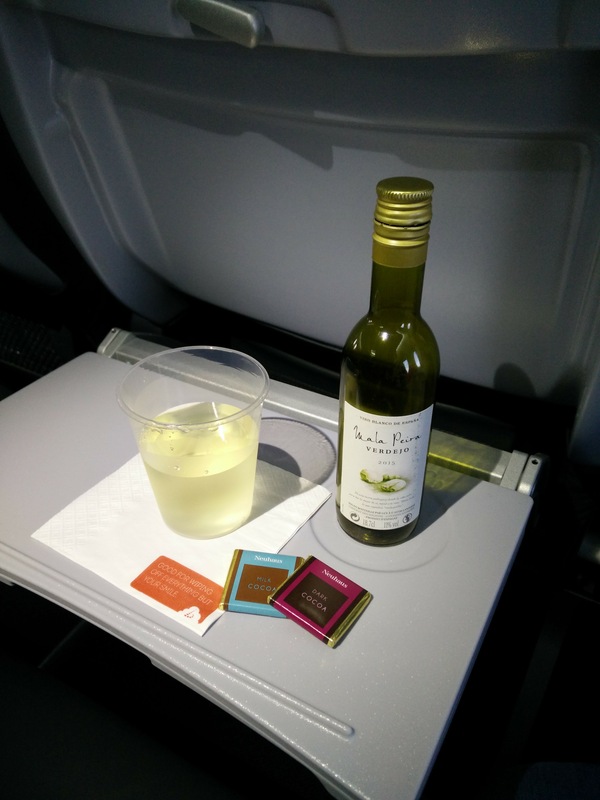 Sick bag, safety instructions and in-flight menu are all located in a nifty little bin under the seat in front of you, positioned in such way that it can’t take away leg space, even when filled with personal items. Although the flights are technically operated by CityJet, obviously one gets the excellent Brussels Airlines service on board. 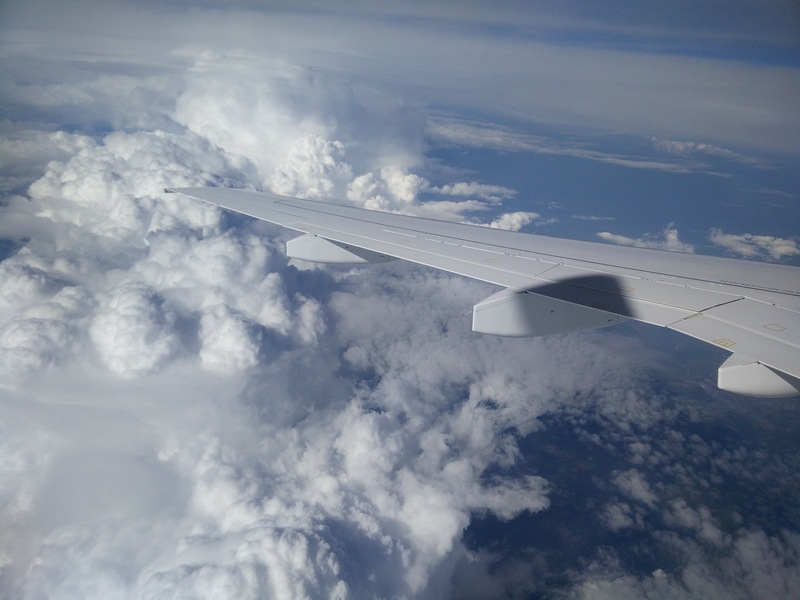 During flight, the cabin noise is at the same level as is the case with other regional jets. Another very nice surprise on board is the spacious lavatory in the back. There’s another in the front, obviously, but the rear one offers proper large space. A small design choice that again indicates smart thinking is the fact that the flush button can only be operated after properly closing the toilet lid, which doesn’t drop down but lowers smoothly instead. The lavatory provides the usual basin and warm/cold water + integrated soap dispenser, and seems easy to maintain and keep clean. In general, the interior of the plane is modern, light, stylish, welcoming and functional. Finally, the flight deck. I’ve absolutely no ambition to even start saying something sensible about it, as I’m vastly underqualified for that, but it looks quite OK to me. I had a short conversation with the pilots who confirmed that the plane is a pleasure to fly and very responsive. To conclude: quite honestly, the Sukhoi SuperJet100 is a little dream come true: a regional jet that offers its passengers vastly more comfort in Economy class than any of the usual long haul Airbuses and Boeings. I think that is quite an achievement, and makes me truly hope that more European airliners will consider adding the SuperJet100 to their fleet. 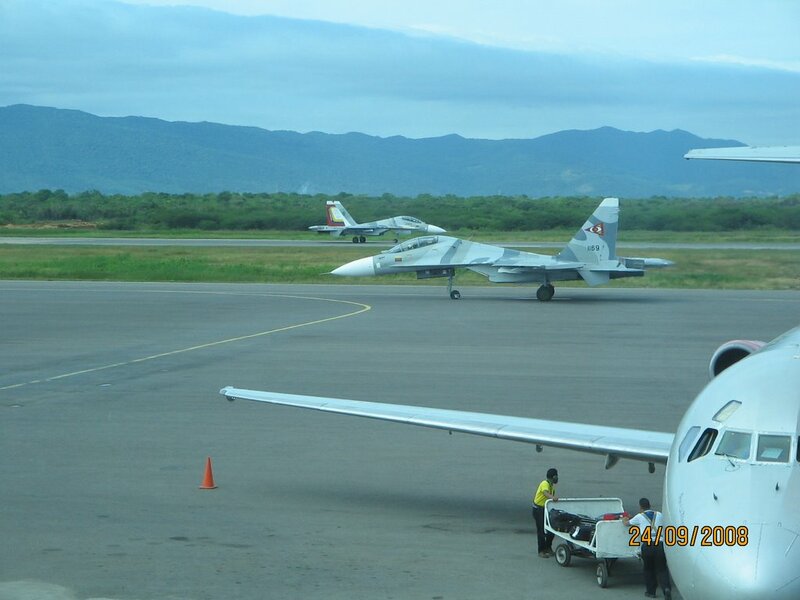 Sukhoi brings a plane that is designed ‘spot on’ and provides very high passenger comfort. Brussels Airlines and CityJet have made a terrific choice! Thank you for your review, you made me lookout after the destinations served using this little bird. Goteborg, see you soon ! 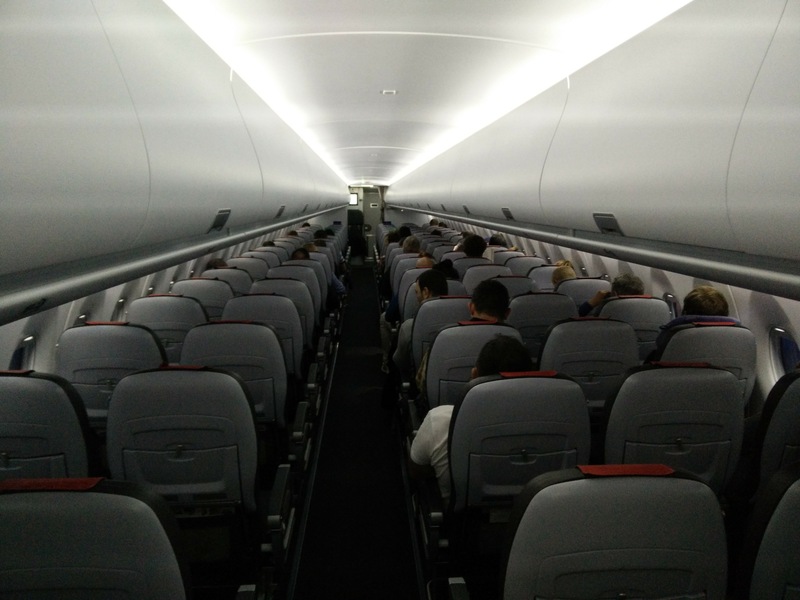 I flew from Moscow to Copenhagen yesterday on a sukhoi superjet, and I totally agree on mostly all your points regarding the superjet, but I found it more quiet in the cabin then in an airbus A319.. I also hope that european carriers open their eyes to this little gem, since it imo way outperforms the competition.. The only reason I could see carriers not choosing the Sukhoi is the 2+3 config, but that is their great loss in passanger comfort and happiness if they do..
Glad you guys enjoyed your ride. But, in reality the SSJ is an unmitigated disaster with reliability rates so bad they literally haven’t been seen in the west in 50 years. All w european (cityjet/brussels) and north american (interjet) operators are dumping it and its reputation could not be worse in the industry. Sukhoi’s strategy to salvage this junker is to make a SSJ100R for “Russified” which means cheaper components and even worse reliability to sell at a lower price to companies and dictatorial regimes under the russian fascist / corrupt thumb. Please remember that the SSJ100 wiki page is hijacked by russian propagandists – read some industry/pilot reports on this terrible airplane.